Looking for a Firefighter Lift Company? For councils managing residential housing, building managers, architects and commercial property managers, fire evacuation planning is now the central consideration in all their decision-making. UK fire safety legislation states that the ‘responsible person’ must make provision to ensure that all the premises occupants are able to make their way to safety in the case of fire. Legislation acknowledges that the planning process will be difficult and complex to achieve, especially as it must make special provision for any occupants with mobility difficulties. At the heart of this legislation is the insistence that responsibility for the safety of residents, in the case of fire, must be shared by both the owner, or manager, of the building, and the emergency services. The installation of a firefighter lift is therefore recommended as part of the measures that can be taken to ensure effective evacuation. The use of a standard passenger lift installation as a means of evacuation in the case of fire is not considered ‘acceptable as means of escape’. The guidance suggests that only lifts that have been specifically designed for fire evacuation, or have been modified according to current fire regulations, will meet the UK fire regulations. Tower Lifts has been installing bespoke lifts for over three decades now, and we are a highly trusted firefighter lift provider and installer. Our firefighter lifts have been developed and tested for use in crisis situations and are considered by experts to be amongst the safest lifts available in the UK for this purpose. 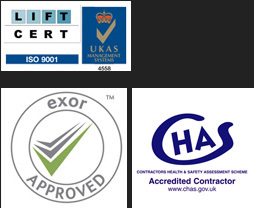 To learn more about our products and services or to arrange an obligation-free consultation, get in touch with a member of the Tower Lifts team today by calling 01525 601099. 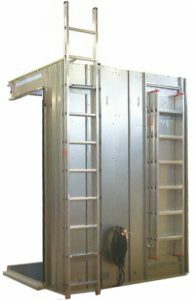 The firefighter lift installation facilitates ease of access from inside or outside the lift via emergency trapdoors and ladders. The firefighter lift control system can be handed over to emergency services. Whatever the safety features, building managers need to know that their lift installation can stand up to crisis conditions, is built to last, and won’t break down, leaving residents without a means of escape. Tower Lifts’ track record speaks for itself; we consistently surpass basic standards of safety, speed and energy-efficiency and our firefighter lifts are considered equal to every demand that has been levelled at them. Alongside our firefighter lift installations we also provide a variety of lift fitting services and maintenance.